The matches keep on coming with week 22 of the Premier League rolling in this weekend. 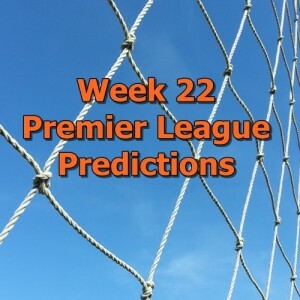 The week 22 Premier League predictions comes in following a crazy set of midweek matches. The top three has been relatively unchanged over the past month, but the biggest change has come in the four through ten places with teams like West Ham United, Stoke City, and Crystal Palace pushing for a shot at top four. With very little time to rest over the past month these matches keep coming thick and fast. Most teams will have had only a few days of rest over the past week and we should see some more high scoring games this weekend similar to the midweek slate. Again, these predictions can be used as a point of reference for my thoughts on results for the weekend and a tool to use when setting up your FPL teams for the weekend. This can come in handy regardless of which fantasy Premier League format you play. Hopefully this weekend’s set of fixtures are as exciting as the week 21 EPL games were. Either way, I do hope this can provide some insight in building your FPL teams. Good luck and have fun!